Tree Mines Global Reserve and resource data is based on the results of the geological exploration performed in 2009 in Kabba-Bunu (Federal Republic of Nigeria) by Nigerian Company EMI Ltd. with participation of Ukrainian specialists, STC of PE “Pivdenukrgeologiya”and geologists of the Federal Republic of Nigeria which confirmed the site is highly prospective for primary gold and also contains elevated contents of Silver, Copper, Molybdenum, Wolframite and Lead/Zinc. Laboratory studies and interpretation of geological materials was carried out by the Geological Service of Public Enterprise “Pivdenukrgeologiya” included in the management sector of the National Geological Service of Ukraine. Based on the results of geological exploration in the area of Kabba-Bunu, a report was made (responsible executive – Boris Borodynja), the methods of work, reserves and resources were tested by the Scientific and Technical Council (STC) of PE “Pivdenukrgeologiya”. The Geological Service and the STC of PE “Pivdenukrgeologiya” has 75-years’ experience in prospecting for exploration of deposits of carbonate materials in the area of drilling technology, geology, hydrogeology, engineering geology, ecology, geodesy, geological and economic assessment of mineral resources and reserves, the technology of deposit development, laboratory, analytical and technological research. Results were reviewed in 2010 by SRK Exploration Services, a reputable British mining and exploration Consultancy. SRK issued a report on the methodology of exploration done and made optimistic recommendations with a view to participate in future exploration. 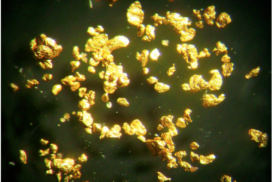 Almost constant presence of placer gold in alluvial sediments of streams, frequent occurrence of relatively large (larger than 1 mm) gold particles (Fig. 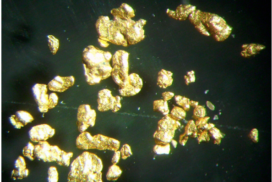 1, 2) and slight roundness of many signs of gold in studied placers of Oku and Chomola indirectly indicate the proximity of an original (or, quite possibly, intermediate) source of methane. Another indirect evidence that indicates the likely presence of gold-bearing hydrothermal-metasomatic formations in the work area are the findings in the beds of watercourses of pieces of vein quartz with rare inclusions of minor sulphides (outcrops 1/5, etc.). Such formations were also identified by search routes on the watershed part of the north- east area of research territory, where they are confined to the node of intersection of Taki-Bunu fracture zone (Oku, Kampe and Taki faults) with the meridional zone of faults, and especially Chomola fault of the northeastern strike.